A group of Maoists on Wednesday set afire vehicles and machines in Bhawanipatna at Kalahandi district, Odisha. These machines and vehicles of a private company engaged for construction of a road under Pradhan Mantri Grama Sadak Yojana (PMGSY). Odisha Police said that eight tractors and one JCB were set on fire by Maoists in the district. 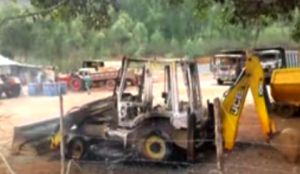 Earlier, Maoists had threatened to a contractor to stop the road construction work. Later the road work processed by a new contractor, police said. Previously a similar Maoists attack was occurred at Minagpadar in the district.